Kenneth Cole is an American fashion brand that creates and manufactures clothing, accessories, and shoes for both men and women. Their designs include both casual and more formal options, so you can find an outfit or accessory for pretty much any occasion! With Big Apple Buddy’s personal shopping service, you can now buy direct from the USA Kenneth Cole online store anytime, anywhere. 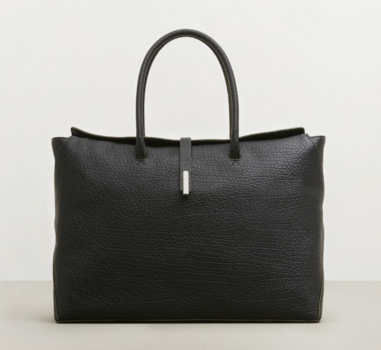 The Fold-Over Leather Tote is made of cowhide textured leather and comes with double top handles and four inside pockets -- two zip and two open. This tote, which will go with pretty much anything in your wardrobe, is the perfect size to hold all of your everyday belongings and is a great accessory to carry to and from the office. Simple and understated, this bag is an easy go-to accessory that will make lugging around your laptop, important documents, and all your other everyday essentials a little bit easier and more manageable. Kenneth Cole is also very well known for their shoe collection for both men and women. The Sound T-Rack Burnished Leather Oxford comes in the easy-to-match colors of navy, brown, or black and will be a classy and elegant addition to any man’s shoe collection. 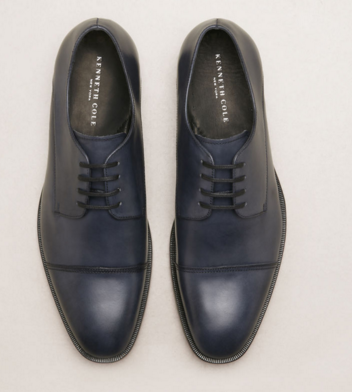 The cap toe gives this shoe a bit of extra flair that will make it stand out from all the other shoes in your closet. This shoe also comes with a cushioned insole with arch support, so you don’t have to worry about experiencing any pain after a full day on your feet. Choose whichever color best matches with the rest of your wardrobe, and these shoes will immediately add a bit of extra style to any outfit! 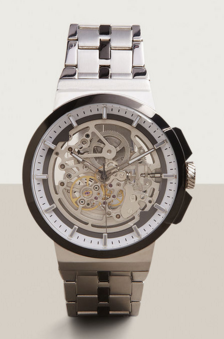 At Kenneth Cole, you can also shop from a variety of accessories, including many different styles of watches. The Stainless Steel Skeleton Dial Watch has silver-tone strip markers that show the inner workings of the watch, so you can see for yourself the impressive technology that goes into this convenient accessory. It is also completely water resistant, so you don’t have to worry about wearing it out on a rainy day or spilling a bit of water on it: your watch should be able to handle it just fine. This watch is a great option for businessmen who are looking for something a bit different or quirky with their watch selection: not only does it do its job, but it does it in style. Unfortunately, the USA Kenneth Cole online store does not currently offer international shipping. However, Big Apple Buddy, your personal shopper, can help you buy products direct from the official USA Kenneth Cole online store and ship them to your doorstep, no matter where you are in the world. We offer international shipping to over 190 countries including Australia, Austria, Bahrain, Belgium, Bosnia & Herzegovnia, Brazil, Brunei, Canada, China, Croatia, Cyprus, Denmark, Estonia, Finland, France, Germany, Hong Kong, Hungary, India, Indonesia, Ireland, Israel, Italy, Japan, Kenya, Kuwait, Lithuania, Macau, Malaysia, Maldives, Mexico, Namibia, Netherlands, New Zealand, Norway, Oman, Pakistan, Philippines, Portugal, Saudi Arabia, Scotland, Serbia, Singapore, Slovenia, South Africa, South Korea, Spain, Sri Lanka, Sweden, Switzerland, Taiwan, Tanzania, Thailand, UAE, UK and Ukraine. If you would like to buy from the USA Kenneth Cole online store, simply let us know which items you would like to order (by filling out the form on the right) and we’ll get back to you with a free international shipping quote within 24 hours!